Guys, I am SO into strawberries right now! 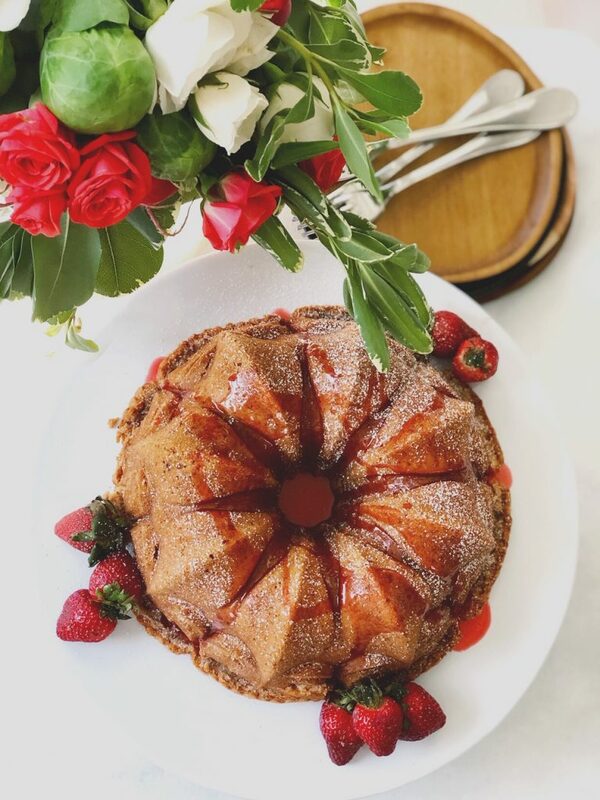 Yesterday, we shared the Strawberry Chipotle Glazed Pork Tenderloin we’re serving up for Easter and today – a Strawberry Pound Cake! I’m so obsessed with this cake. It is so good. We’ve already made and devoured two of these. In one week. This cake is: moist, sweet but not too sweet, full of strawberry flavor, buttery, and did I mention, moist? Don’t you love that word? 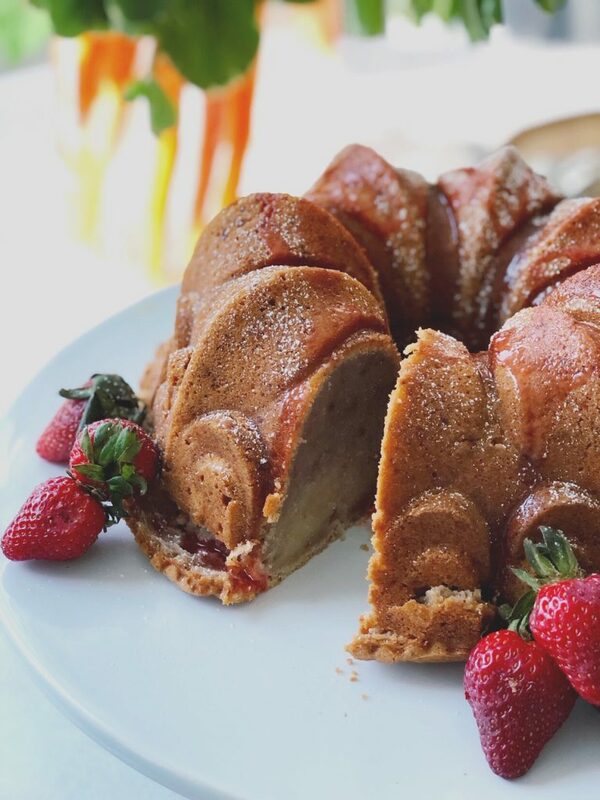 I’ll say it again for the people in the back – this pound cake is so MOIST! I’m also writing this as we’re baking a third (a gift to a friend, thankfully not staying in the house), and it’s wafting in here and it just even smells so incredible. What comes to mind when you think of an Easter main dish? I was honestly st-rug-gl-ing with this year’s menu because I thought lamb (did that last year) or ham. And I don’t like ham (only in a croque monsieur, and only in a croque in Paris). So, I thought, let’s dress up some pork tenderloin! 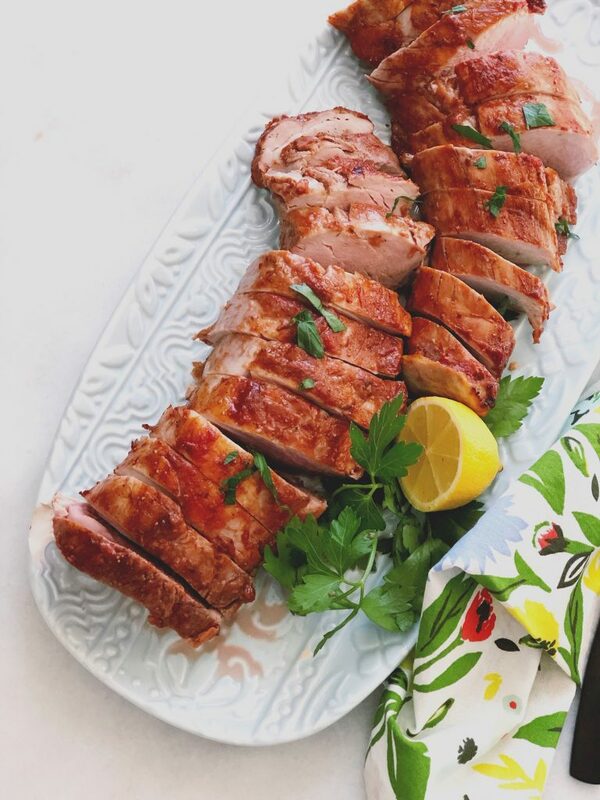 And then, this strawberry chipotle glazed pork tenderloin was born. And y’all. It’s SO easy. 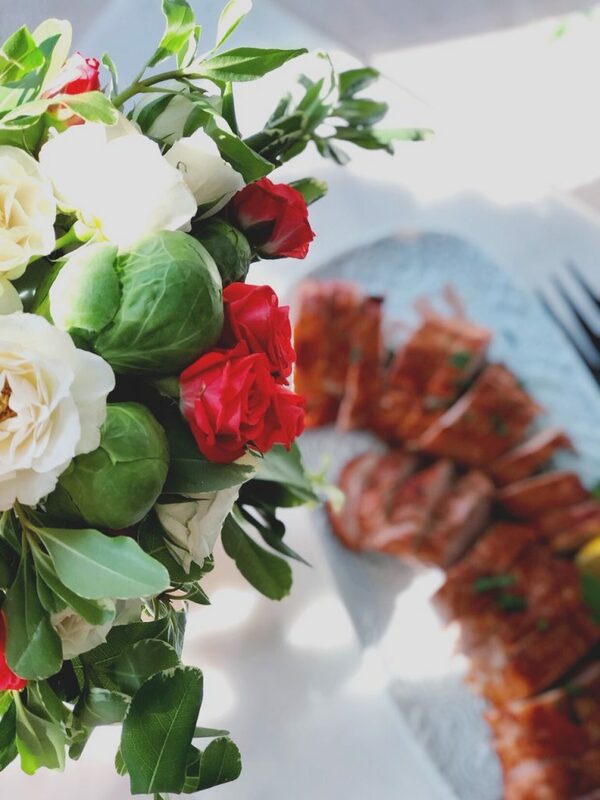 I wanted to showcase strawberries in the dish to really bring the whole #springtime vibe to the table, and I wanted to keep everything feeling light and fresh. This pork went perfectly with the braised artichokes and burrata salad from earlier in the week. And, the dessert you’ll see tomorrow….went perfectly with this, too! Don’t you just love granola? Such a good snack, or over yogurt for breakfast, or even with some really cold almond milk over it. Granola and me, we’ve got a thing going. 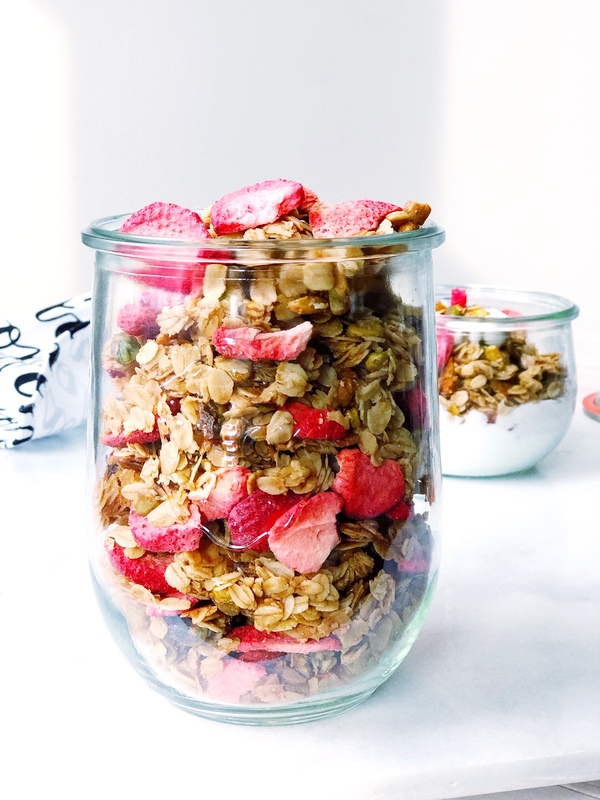 This granola has been one of my favorites recently – totally have this one on repeat and have made it so often I’ve found the need to give jars of it away. This gal does not need to be eating granola at every meal, ya know? I love a fruity, bright flavor this time of year, especially after such brutally cold weather last week! If I turned my back to the windows, stood in front of the heater, and took a bite of this granola with a little (almond) milk, I almost felt like it was spring. Almost. For the yogurt parfaits, I added a little bit of strawberry jam between the layers, which I felt really pulled the whole parfait experience together. 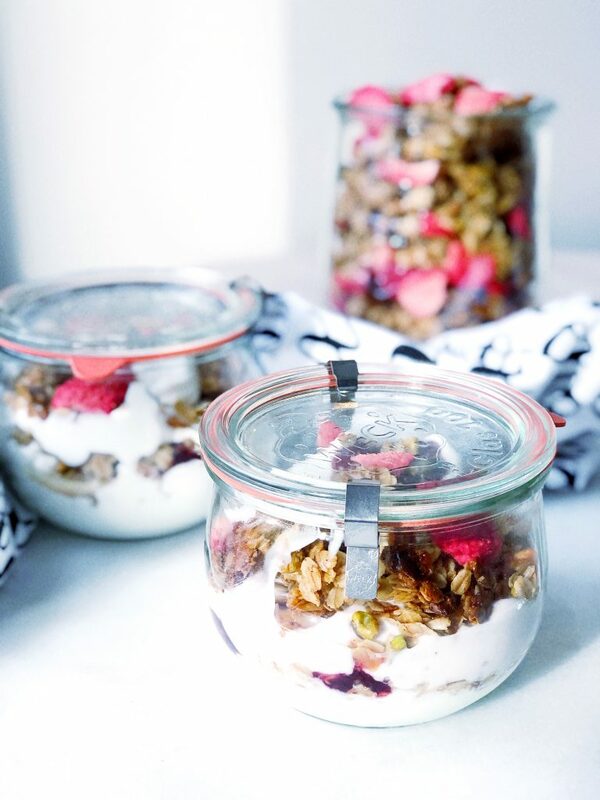 The sweetness of the jam complimented the plain greek yogurt and elevated the granola with just a bit more sugar. I also used a combination of plain greek yogurt and strawberry greek yogurt, which honestly just looked pretty! Sometimes you just have to do it because it looks prettier, right? !